Climate change is generating new and emerging challenges as well as opportunities for business. It will require innovation and collaborations that reconsider how we source, process, produce and distribute the energy, food, water and goods that make our lives healthy and productive. The business community should see these economic and ecological imperatives as opportunities to act with urgency and ingenuity. Every day at Dow, we are driving innovations that harness material, polymer, chemical and biological science to help address many of the world’s most challenging problems such as the need for clean water, clean energy generation and conservation, and increasing agricultural productivity. We are combining the power of sports and science with the power of collaboration to catalyze action on climate change and help build a more sustainable future. Sports offer a unique means to engage a large and global audience – both in the business and the consumer worlds. The increasing attention given to greenhouse gas (GHG) emissions by event organizers and stakeholders provides an opportunity to establish meaningful and lasting mitigation programs. Motivated by Dow’s goal to drive collaborations for a more sustainable planet, Dow created the Climate Solutions Framework to address the need for clearer guidance on how to properly manage and mitigate the GHG impacts of events and to lay out options available for GHG mitigation beyond the event’s physical and temporal boundaries. To go beyond the GHG emissions in the event inventory and provide a methodology for accounting for an event’s broader societal GHG impacts. To enable business and institutional leaders to implement innovative GHG-mitigation projects beyond the physical boundaries of the events. To provide organizations with opportunities to take responsibility for the climate impact of events and demonstrate leadership in the development of low-GHG products and service solutions. Efforts to apply this Framework are well underway. For example, as a Worldwide Olympic Partner and the Official Chemistry Company of the Olympic Games, Dow’s partnership with the Olympic Movement enables us to use the platform, of sport and the Olympic brand to demonstrate how our science and technologies can advance the adoption of lower-carbon solutions. The Rio 2016 Olympic Games have provided us with a unique opportunity to start a new dialog and collaborate with industry leaders to introduce solutions that will benefit generations to come. Building on the successful implementation of the “Sustainable Future” program that enabled the mitigation of the direct carbon footprint of the Sochi 2014 Olympic Winter Games Organizing Committee, Dow was selected as the Official Carbon Partner of Rio 2016 and developed a portfolio of projects in the areas of agriculture, industry and infrastructure. These projects delivered 100,000 tonnes of verified GHG emission reductions by the Opening Ceremony and will continue to generate climate benefits throughout the realization period – which goes through 2026. Working with Rio 2016, Dow designed a tailor-made program to address the environmental and technology needs of Brazil and Latin America by introducing low-carbon solutions and practices within key sectors of the economy. 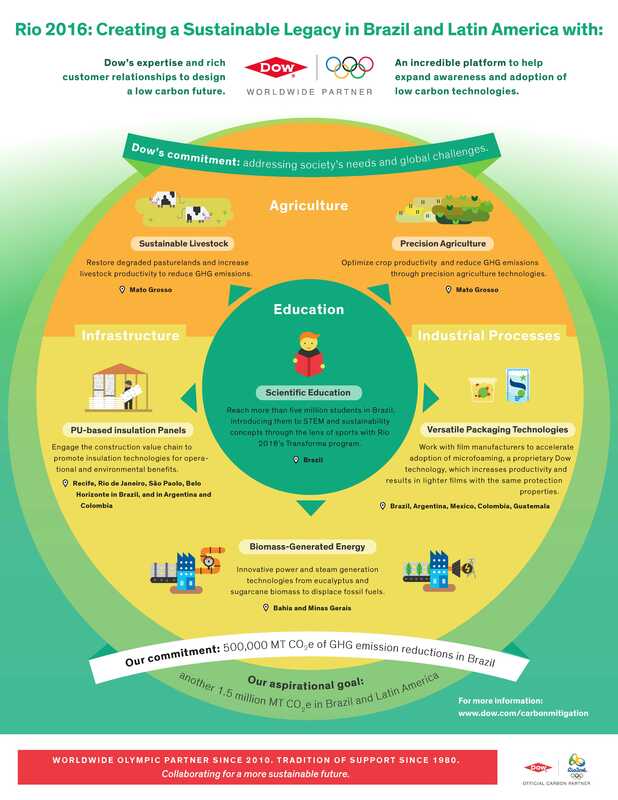 Dow’s portfolio of projects enabled businesses to enhance productivity and conserve energy by switching from fossil to renewable energy sources, optimizing resources in agriculture and livestock farming and building capacity for more energy-efficient infrastructure, leading to long-term changes in the market. Months before the Games, Dow collaborated with customers and expert partners to get an understanding of the local market environment and where there were opportunities to increase awareness and adoption of energy-efficient and low-carbon technologies in the region. Important criteria for the carbon mitigation projects implemented by Dow included economic viability within the Brazilian and Latin American reality and that they go beyond typical business practices, or are “beyond business as usual,” to deliver GHG emission reductions. This ensures that low-carbon initiatives are not simply a byproduct of normal operations but rather are the result of innovation and change. Eight projects were selected on the basis of their ability to push for innovation, overcome real or perceived barriers and catalyze long-term change in market practices. In addition to the carbon mitigation goals, Dow and Rio 2016 committed to reach half a million people in Brazil to raise awareness of sustainability and climate change. Dow engaged decision-makers within the construction industry by hosting seminars on energy efficiency and included the farming community in a dialog on more sustainable agriculture practices. In addition, Dow supported Rio 2016’s Transforma educational platform to reach over 7 million students. As the premier corporate partner of Transforma, Dow expanded the platform by adding nine science classes to the curriculum, covering concepts on sustainability, chemistry, physics, and biology through the lens of sports and the Olympic and Paralympic Games. Transforma has been rolled out to all 27 Brazilian states since its implementation in 2013. Learn more about Dow’s Greenhouse Gas Mitigation Framework at www.dow.com/carbonmitigation.